What if walls could talk? Better yet: What if you could hear them, and look into the past, present, and future like never before? The Amazing Kids! Mystery Interviews, is a series that takes you on a journey with things that usually don’t talk. But now, they do! Read our interview for this issue and keep your eyes peeled for clues. Go to the bottom and check out the “Who Am I” section for the final dish on our inanimate interviewee! NOTE: As a parting farewell to our original Mystery Interview writer, here’s the first draft of what eventually became the idea for the Mystery Interviews. It’s a little silly and fun, and it was the very beginning of the line of Mystery Interviews. Enjoy! AK: What is your greatest aspiration for your life? Do you have any? CO: Oh, Yes! I want to be a movie star and go to Hoppywood, you know? And wear sunglasses. And eat plants on the set. AK: Who or what has been your biggest influence? CO: AGH! Tennis Shoes! They give me insect bumps. I can’t stand em’: Watch where you walk! I might be there. You just never know. So tennis shoes, um, yes, they count as a very big influence in my life. AK: If you weren’t what you are now, what would you be? CO: A pair of sunglasses, yes, or an elephant. Then I would be BIG. But elephants can’t fly, so I’d never want to be something that couldn’t fly. Sunglasses…hmmm…they can fly if you throw them, I guess. AK: What do you see as one of your greatest accomplishments? CO: There’s so many to pick from! Ahhh…I won 10th place in the hurdle jumps at the Caelifera Olympics last fall. Oh! And I scared a mouse away, once. I flew at it with all my might. That thing wanted to eat me! AK: What are you passionate about? CO: Sunglasses and oats. I like oats. And I like orange trees. I love orange trees, yes, that’s what I’m passionate about! AK: What’s the deal with liking sunglasses? Do you live in a sunny place? CO: I live in the grass! I don’t need sunglasses. Hmm…but sometimes I wish I did. Grasshoppers are insects that love to eat plants and can fly. Mice are one of the grasshopper’s main predators. 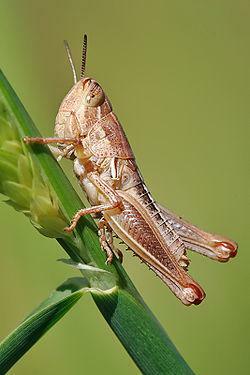 Grasshoppers love to munch on oats and orange trees, much to the dismay of farmers!